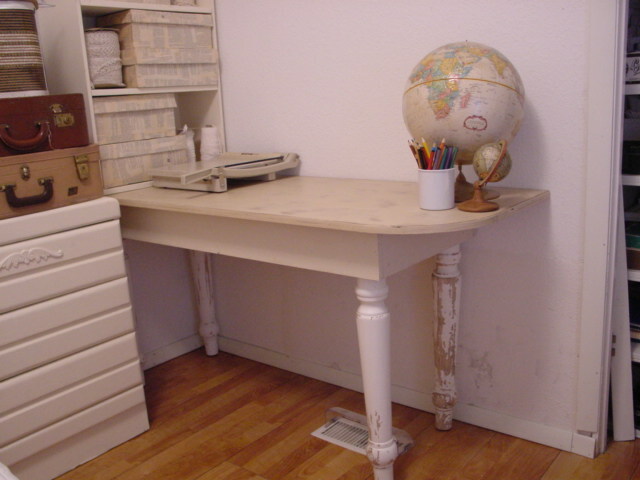 THIS was the perfect spot for the work table since we had to leave open space for the heat/air vent. Why is that one corner rounded? Because I am a KLUTZ and would surely bump into a pointed corner while trying to access my craft supplies in the closet! The legs came from a rummage sale. 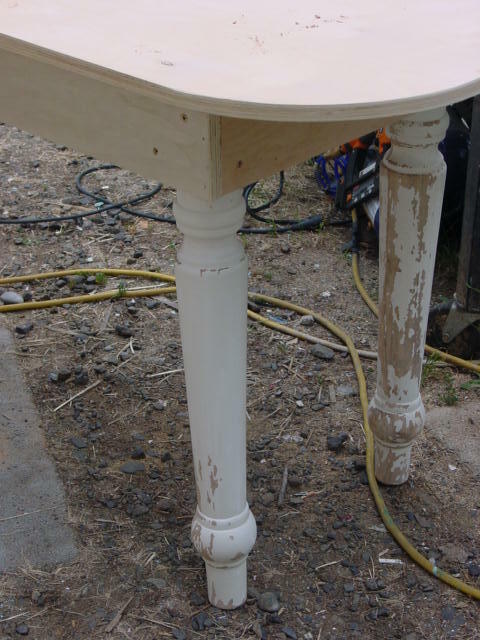 The rest of the table was built using reclaimed plywood. 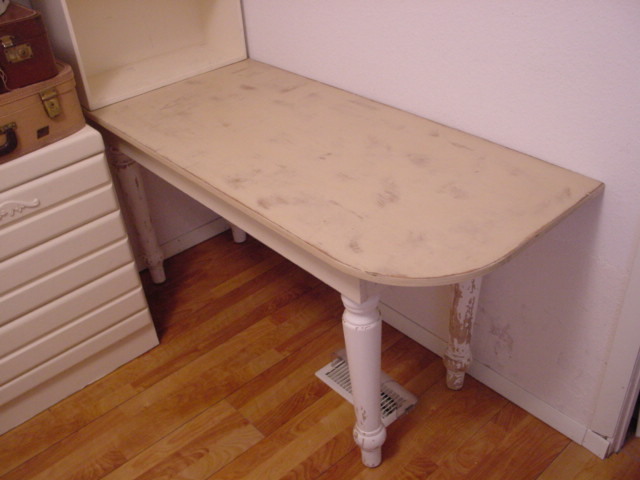 After a bit of sanding, it was ready to be painted. 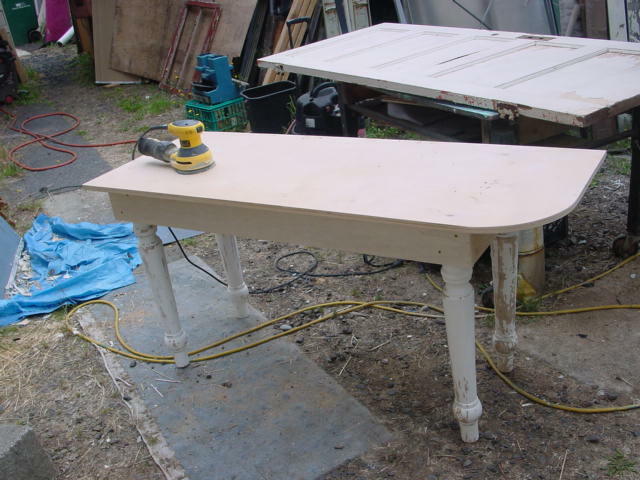 I just ‘used what I had’; a non matching (to the legs) off white. Two coats of paint. A good sanding so some of the wood showed through. A QUICK dose (wipe on and immediately wipe off!) of a medium stain. 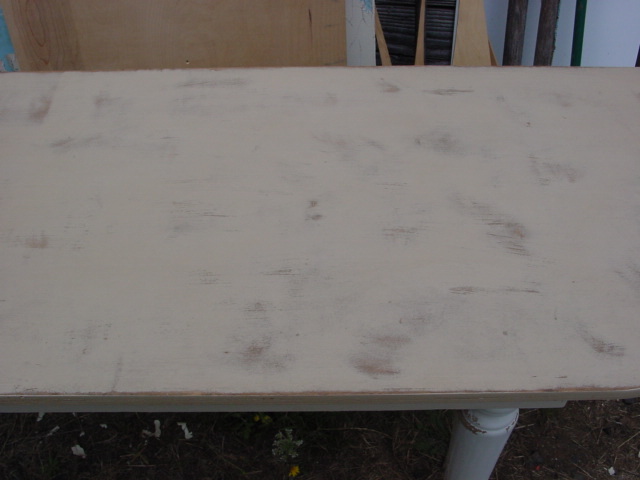 Let the stain dry/cure overnight. Then two good coats of matte varnish. Perfect fit! Well, of course the table fit perfectly between the dresser and the wall because Michael built it specifically for that spot. 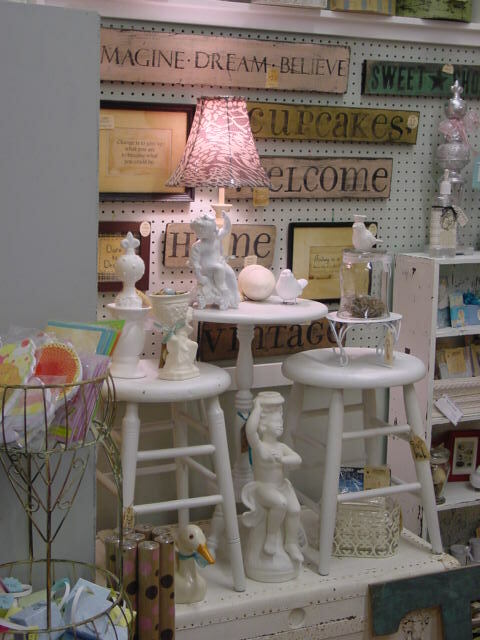 The white shelf on top of the table was one left over from our space in Camas. I dragged it out of storage to use ‘temporarily’ until Michael gets my big storage cabinet built later on. Then I discovered it fit right at the end of the table! 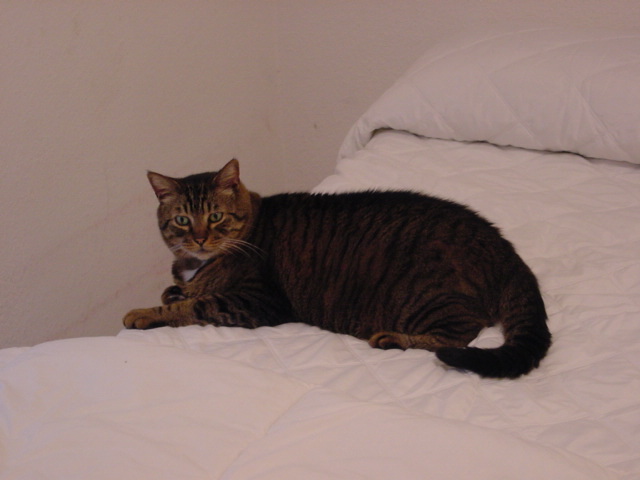 Kitty Spike supervises, and highly approves of the comfy new bedspread! 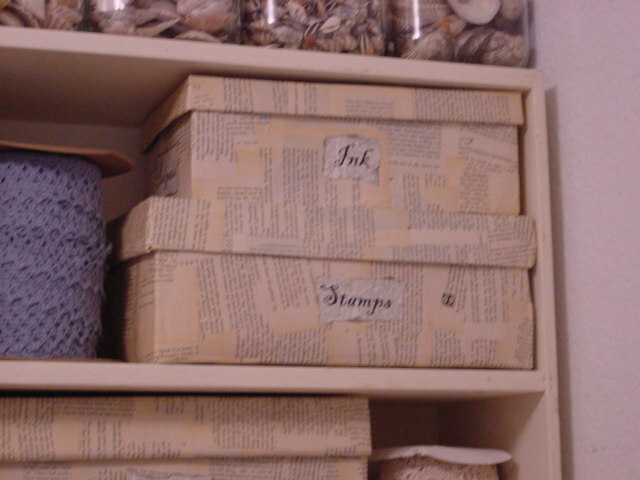 These old shoe boxes that I covered with torn book pages fit perfectly on the shelf!! 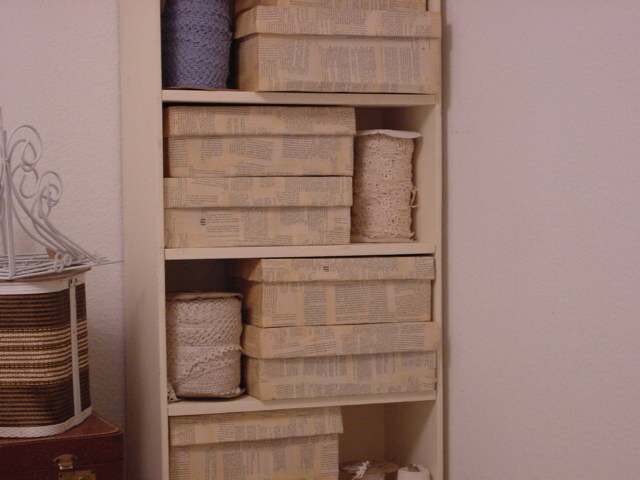 The ‘labels’ were on the ends of the boxes, so I’ll have to make new ones for the side that now faces front. 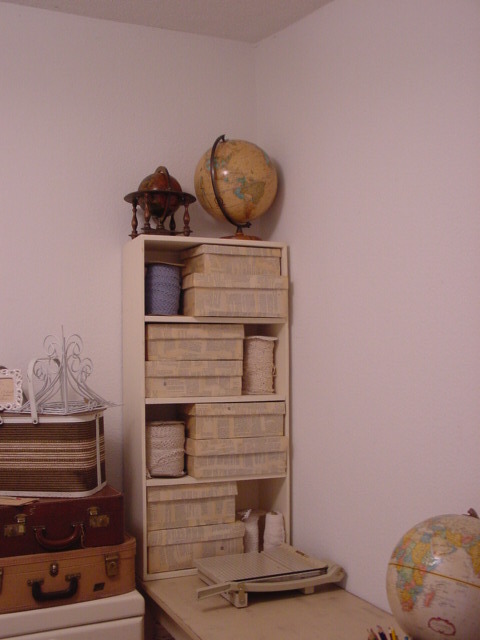 And my big spools of lace fit right in there too! 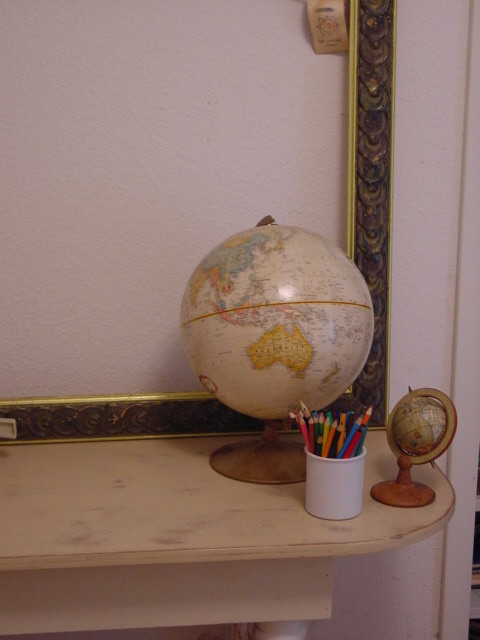 Wanted to see if I could fit my globe collection in the room to add a pinch of color. Most of them are tan/cream; a few are the typical water blue; which would be the perfect touch of color. But I’m not sure they will all fit. 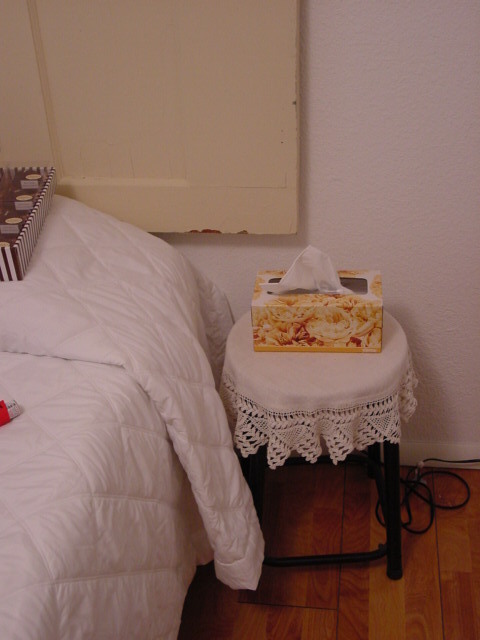 Will have to reconsider them when I get closer to being finished with the room. The spot on the table just in front of the shelf is a perfect place for my paper cutter! Now that I can leave it out, I’ll use it a lot more. Might make this big vintage frame into a bulletin/memo board??? 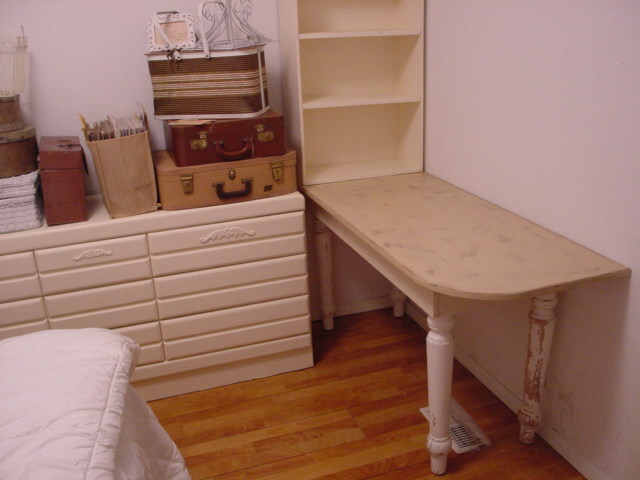 And IF I do, need to decide if I should ‘leave it as is’ or paint it to match the room???? Got my new box labels done; and took the globes off the top shelf. Yes, I really DO have that much glitter!! Some of it is really OLD stuff leftover from my childhood! 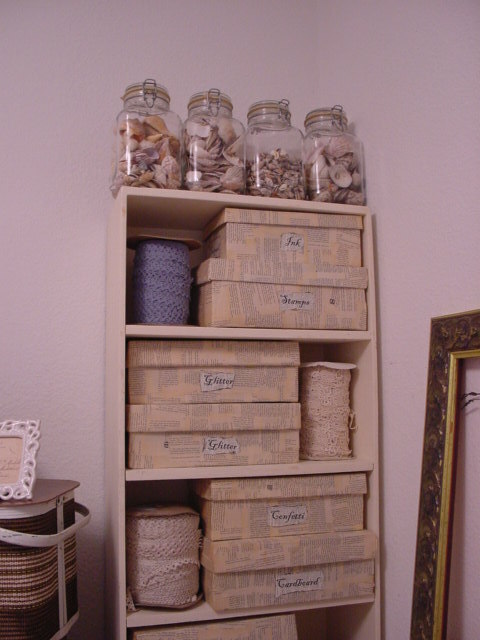 Big gallon size vintage canning jars filled with shells have replace the globes on the top of the shelf for now. I use those shells for lots of craft projects, but I also like to SEE them. This is better than in a box in the closet at least! See the taller stool in between the other two? That would have been perfect! Oh well, something else will come along! We’ll look at the headboard and window treatment next time. 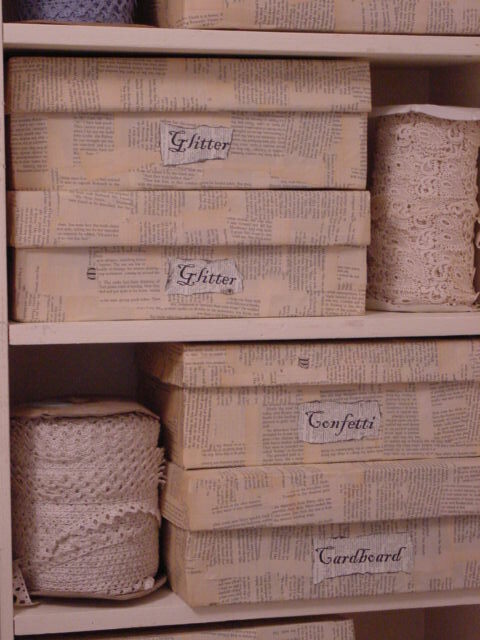 I LOVE your paper covered shoe boxes!!! They look fantastic and not much $$ Thanks for the idea!